"Get ready to Party" A common scream from the announcers as the annual Chingay parade began. This year marked the largest two days of parades celebrating Chingay since it began on the streets of Singapore in 1973. There were over 8,000 participants in this year's parade, and that's just the marchers. There were thousands who paid 25 to 45 Singaporean Dollars each for a seat in the main stands where the parade began. Thousands more lined the parade route and everyone was encouraged to participate in the festive mood. Frenzied shouting and cheering is part of the celebration. Dancing groups made up the majority of the parade. The evolution of Chingay is synonymous with the growth of Singapore with it's social and ethnic diversity. The parade itself began in 1972 mainly as a celebration of the Chinese Lunar New Year and was made up almost entirely of Chinese entrants. Chingay participation expanded to include groups from around the world, and over the years there have been entrants from Europe, Tahiti, Brail, Japan, Indonesia, Korea, Ghana, and many more. Entrants from Singapore's Little India. Chingay is part Chinese New Year celebrations, part Samba or Mardi Gras, and part street party. Chingay has grown to be the largest such celebration in all of Southeast Asia. The word Chingay is from the Hokkien dialect of Mandarin meaning "the art of masquerade". The best time to visit Singapore is undoubtedly during Chingay. Singapore is a multi-ethnic island city with a reputation of being the most sterile city in the world. It is very clean and things do seem to run like clockwork, and while it is illegal to litter and spit, its not, as rumored, illegal to fart. Indians, Malays, Indonesians, Chinese, Koreans, Japanese, and just plan Singaporeans. The largest group in the parade was a throng of youths handling the massive red silk tarp that spanned the parade route. The only entry from the Americas - Mexico. Not sure how many of these participants are actually from Mexico, or even been to Mexico. But I suppose it really doesn't matter. There were two groups from Europe. One from Germany and this group overly active Danes. A women's group made up entirely of women over the age of 55. One was in her early eighties. Star Wars characters led by Darth Vader. The African groups. Not from Africa but Singaporeans dressed in festive African animal costumes. This year's Chingay parade, both Saturday and Sunday, was the most organized parade we've ever attended. Have you ever attended a parade with huge gaps in the the "action"? Sections where nothing was going on and usually right in front of you. Well, the Chingay parade is run and paced by music. The parade route is lined with loudspeakers piping out music. There is a motif for marching and a separate motif for performing. Marching groups perform their routines when the performance music is blaring and the entire parade moves on when the marching music begins. What's a parade without the Music Man. Live firecrackers have been banned for most celebrations in Singapore since 1972 when two people were killed as a result of a massive firecracker explosion during the Lunar New Year celebration, but this is Chingay and if there are going to be fireworks, there may as well be firecrackers. Most ceremonies in Singapore which would normally use live firecrackers now use simulated firecrackers. They pose little of the potential dangers of live firecrackers but still have a somewhat muted sound of firecrackers. The ban on firecrackers, although necessary, disappointed many people who felt it dampened the lively spirt of the celebrations. Fireworks capped the end of the parades. and... any parade associated with Chinese New Year will end with a dragon. Two 88 metre long dragons in the sky made them the longest floating dragons ever in Singapore. Malaysians today are a highly sophisticated population with a wide cultural mix. Malaysia's population is estimated to be around 28 million with roughly 65% being Malay and Bumiputras. Chinese make up 26% of the population and Indians 7%. By constitutional definition, Malays are Muslims who practice Malay customs and culture. Islam is the official religion of Malaysia and is practiced by approximately 60% of the population. The Malaysian constitution guarantees religious freedom and 19% of the population consider themselves Buddhists, 9% Christians, 6% Hindus, and 2.6% other Chinese religions (Confucianism, Taoism). The cultural diversity is most evident in the urban areas where roughly 70% of the population resides, and especially here in Kuala Lumpur. Jalan Alor in the vibrant Bukit Bintnag neighborhood. We've been eating almost non-stop since arriving here in Kuala Lumpur. I don't want to sound like a Cantonese foodie snob but we do love to eat Chinese food and Cantonese in particular. The range and choices are incredible here and its all very good. Sure there's Tony Roma's, Pizza Hut, Krispy Creme, and KFC here but we don't eat that stuff back home so why would we do so here. 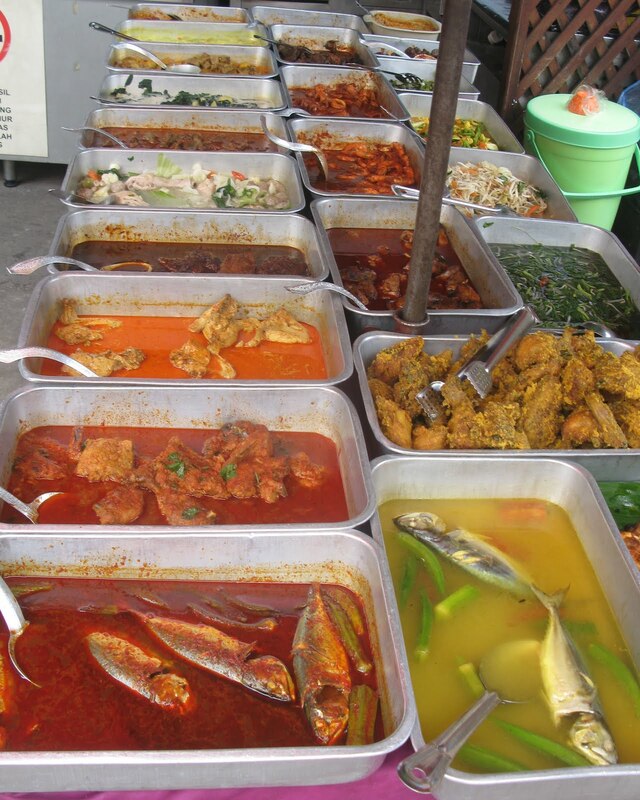 The Malaysian and Chinese options are so plentiful you have to try as much as you can while visiting. There's everything from Herbal Chicken clay pots, to Portuguese grilled fish, to durian custard tarts, to bamboo charcoal bread. There's even something called snowflake soup. Jook, or rice porridge for breakfast, brunch, lunch, or dinner. 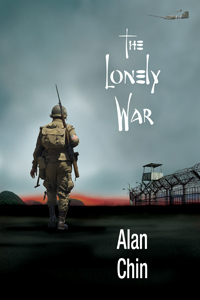 I'm having raw fish, Alan's having bitter melon and pork. Dim Sum accompaniment. If you're Cantonese, like I am, you probably love tofu fah. Its a soft tofu custard usually served warm with syrup. 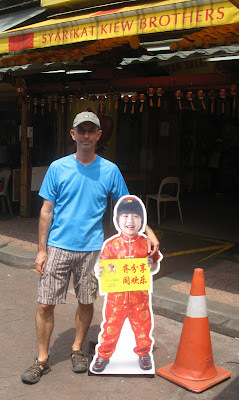 The best place for it is this little stand on Petaling Street in Chinatown. The price is twice as much and half as good anywhere else. Fish is very popular in Malaysia and its all very good. This is Stingray cooked with Malaysian okra in a yummy sauce. This particular beef noodle soup has been around for over 75 years in KL. It's now located in the basement food mall of Lot 10 in Bukit Bintang. The soup with beef balls, fresh beef and trip go into the bowl of noodles with the dark heavy bean sauce. It's incredible to say the least and a must try when in KL. This particular set meal which includes a veg and tea is $2.50. Hokkien noodles. Very popular and found everywhere. 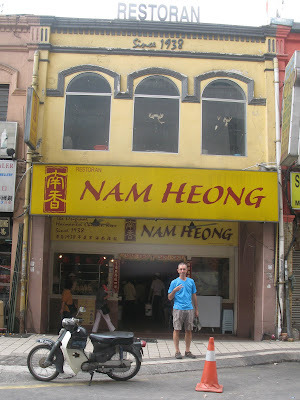 Nam Heong is sworn to have the best Hainanese Chicken Rice in Kuala Lumpur. Located one street over from the tourist market Petaling Street in Chinatown, its a must stop for lovers of simple Cantonese food. Alan posing outside Syarikat Makanan Salai Kiew Brothers. Tofu, lamb curry with rice and seaweed soup. 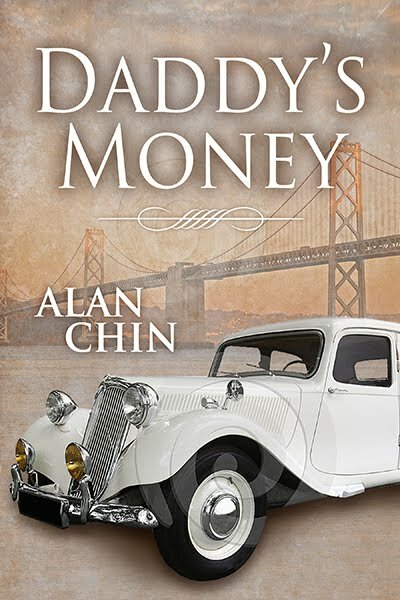 About $2.50. 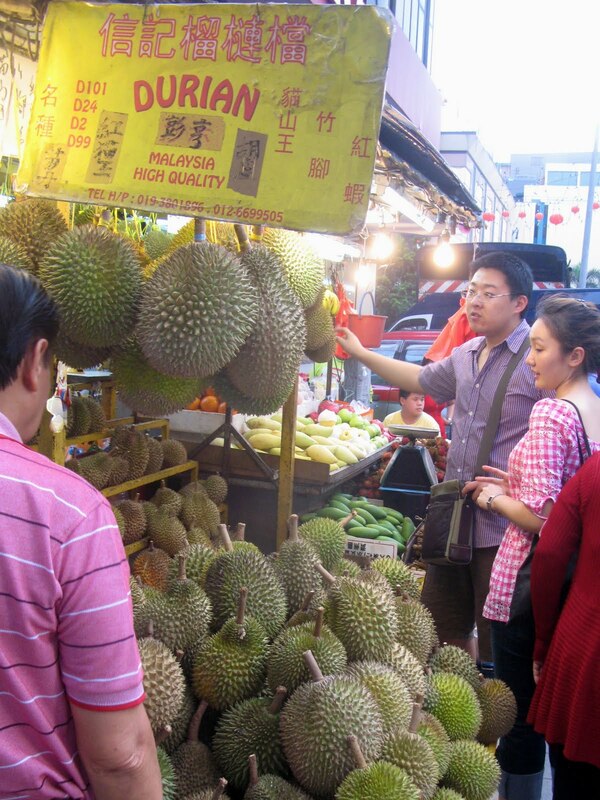 Malaysia seems to be a popular place for eating durian. I'm not sure if its the higher quality available here, as its claimed to be, or just the sheer number of durian eating people here in Kuala Lumpur. In any case, durian stands are strategically located throughout the city, mostly where people congregate and eat outdoors. Your nose will lead you to a nearby stand. Its Chinese New Year so everyone's getting into the spirit, so why not Pizza Hut. A pizza in the shape of a Chinese coin. What good luck.